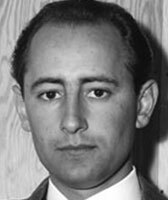 Frank Malina was born on October 2, 1912, in Brenham, Texas, and went on to become one of the first rocket engineers. He graduated from Texas A&M University in 1934 then moved to the California Institute of Technology on a fellowship. He earned master’s degrees in mechanical and aeronautical engineering at Caltech before beginning his Ph.D. work on rocket propulsion. In 1936, with help from Caltech professor Theodore von Kármán, Malina formed the Graduate Aeronautical Laboratories (GALCIT) Rocket Research Project. His research with this group led to his 1940 Ph.D. thesis on rocket propulsion theory. That same year, he received his first funds from the U.S. Army Air Corps and started construction of research and testing facilities near Pasadena. In 1944, the site was constituted as the Jet Propulsion Laboratory. One of JPL’s early successes for the Army was a technique named JATO, or Jet Assisted Take-off. Malina, von Kármán and their colleagues decided to create a separate company to manufacture JATO rockets and founded the Aerojet General Engineering Corporation. JPL remained a research organization, and Malina became its director in December 1944. His leadership oversaw the successes of the experimental unguided rocket, Private A, and its successor, the WAC Corporal, which set an altitude record in 1945. As a graduate student in the 1930s, Malina, like many other intellectuals of his time, believed that capitalism had essentially failed. The US was in the midst of the Great Depression, while similar economic problems afflicted Europe. In a November 1936 letter, he told his parents that he hoped a “farmer-labor party with some power” would emerge by the next election. The Federal Bureau of Investigation’s California office persecuted him throughout World War II, believing that he had been an active Communist Party member and accusing him of not disclosing that status on a security questionnaire. In 1947, unhappy with both his political persecution and with the fact that his work was increasingly tied to nuclear weapons, Malina resigned from JPL and moved to France. The biologist Julian Huxley offered him a position with the United Nations Educational, Scientific, and Cultural Organization in Paris (UNESCO). In 1953, he left and became a kinetic artist. He enjoyed some success as a sculptor, often invoking themes of science and engineering in his work. He never returned to research, although in 1960 he helped found the International Academy of Astronautics with von Kármán and others to foster international cooperation in space exploration. In 1968 he founded Leonardo, a journal conceived of the notion that there should be an international channel of communication among artists, with an emphasis on artists who used science and technology in their work. After his death in Paris in 1981, under the leadership of his son, Roger F. Malina, Leonardo moved to San Francisco, CA as the flagship journal of the newly founded nonprofit organization Leonardo/The International Society for the Arts, Sciences and Technology (Leonardo/ISAST). Today it is the leading organization for artists, scientists and others interested in the application of contemporary science and technology to the arts and music.